To be an effective Kindergarten teacher, you need a little bit of fun and a lot of patience. Those little sweethearts are anxious to mop up any information you can send through their ears. They are eager, excited, and sometimes very random in their behavior (…but that’s why we love them!) To help you teach the some of the Kindergarten basics, we have put together a bundle that includes Kindergarten activities for teaching basic skills. The Have Fun Teaching Kindergarten Basic Skills Activities Bundle has everything you need for teaching basic skills in Kindergarten! These activity centers are ready-to-use and only require minimal prep (printing and some cutting). If you are a Kindergarten teacher looking for fun ways to teach basic skills, these small group and independent learning activity centers are just what you need! This Kindergarten Basic Skills Bundle includes the following printable Kindergarten activities for teaching basic skills. A Frog and a Log – Position Words Activity: Match each frog with its sentence and the correct word card. Complete the worksheet. Alphabet Uppercase Letter Matching Activity: Cut Out Letters. Place Matching Letters on the Alphabet Board. Apples Theme Vocabulary Activity: Apples Seasonal Skills Practice, perfect for a Pocket Chart Activity, High Frequency Words, Sequencing, and Text Matching. Call My Maybe Phone Number Activity: Learn your phone number by practice dialing on the cell phones! A teacher writes your phone number in the phone’s window for you to dial. Practice dialing on the phone to help you remember your number. Use the mini-number cards to arrange your phone number in correct order. Color Words Mouse Matching Activity: Match the colored mice, with and without color words, to the paint colors and color word flash cards. Also includes a mini book of colors for the kids to create. Comparing Adjectives Sequence Activity: Use the picture cards to practice using comparing adjectives. Select a set of comparative adjective (ex. tall, taller, tallest) word cards. Cool Tools for School Rules Activity: This is a great Classroom Management Set that includes Classroom Jobs cards, Classroom Rules “I Can” posters, Classroom Rules “I Can” mini book, Character Counts anchor charts, with space for student-generated rules, Behavior Clothespin Chart, and “Caught Being Good” coupons. Farm Animals Sequencing Patterns Activity: Use the farm cards to complete the farm theme sequences. Also includes 2 worksheets for drawing and completing patterns. Full and Empty Activity: Grab your friends and race to the finish line as you identify whether an object is full or empty. Select a car to be your playing piece and place it on the starting line. Shuffle all picture cards and place on the game board. Gingerbread House Decorating Following Directions Activity: Practice reading and following directions with this gingerbread activity. Select a gingerbread house directions mat. Read and follow the directions in order to correctly decorate the plain gingerbread house! Hot and Cold Camping Activity: Play the Hot and Cold Camping Board Game to distinguish between things that are hot or cold. Grab a partner and deal 5 marshmallow picture cards to each player. Place the marshmallows on your personal ‘roasting’ stick. If players land on a square with a red circle, they must discard a picture of an object that is hot into the large fire on the game board. If players land on a square with a blue circle, they must discard a picture of an object that is cold. If a player does not have a correct picture to get rid of, their turn is skipped. The first player to discard and “toast” all of their marshmallows in the fire is the winner. Lucky Charms Before and After Activity: Larry the Leprechaun is looking for his pot of gold! To help him find it, you must learn and identify the positions before and after as you look through the lucky charms! This activity includes two ways to play: Simon Says and Lucky Charms Center. Order Up Sequencing Activity: Cut apart the picture cards and mix them up. To complete the activity, use the sequencing mat to put three pictures in order. After sequencing all of the pictures, choose one event to illustrate on the included worksheet. Draw the 1st, 2nd and 3rd pictures and write a sentence below the picture. Position Words Activity: Go apple picking by placing apples in different positions. Place the Position Mat in front of you and shuffle the green position cards. Players take turns drawing a position card. Read the card and then put the apple in that place. If you need, use the Positions Posters to help you put the apple in the right place. After all cards are drawn, complete the Cut and Paste book. Read page of the book to find out where the apple should be glued. Cut and paste the apples in the right position. Read the book to a friend when you are done! Roll A Turkey Thanksgiving Activity: Practice a variety of skills with this activity! Cut out the turkey body parts so you can “build” a turkey. Select a dots, numbers, or custom directions sheet. Use the custom sheet to add in letters or sight words. Roll the die. Match that number or side to the body part of your turkey. Continue to roll the die until you’ve added all body parts to the turkey: (head, beak, wattle, wings, legs, and four feathers). Play with a partner and have a race to see who finishes first! Same and Different Snowflakes Activity: This center includes two ways to play: Activity 1 – Which Snowflake is the Same? and Activity 2 – Which Snowflake is Different? Simon Says Left and Right Activity: Play Simon Says to practice identifying left and right. Choose between the Left/Right labeled game mat or the unlabeled game mat and place in front of all players. Deal picture cards out to players. Simon draws a “Simon Says” card and reads the rebus-style directions. The player with that picture must place the picture on either the right or left side according to Simon’s directions. Game continues until one player discards all of their picture cards. The Day the Crayons Lost Their Color Matching Activity: The box of crayons has lost their color and need your help! Each player receives a crayon box to fill. The object of the game is to travel around the game board to collect the colored crayons needed to fill your box. Roll a die and move that many colored spaces. If you land on a color that you need in your box, take that color crayon and place it inside your box. Players take turns moving around the game board and collecting crayons. The first player to fill their crayon box is the winner! After game play, complete the coloring worksheet. 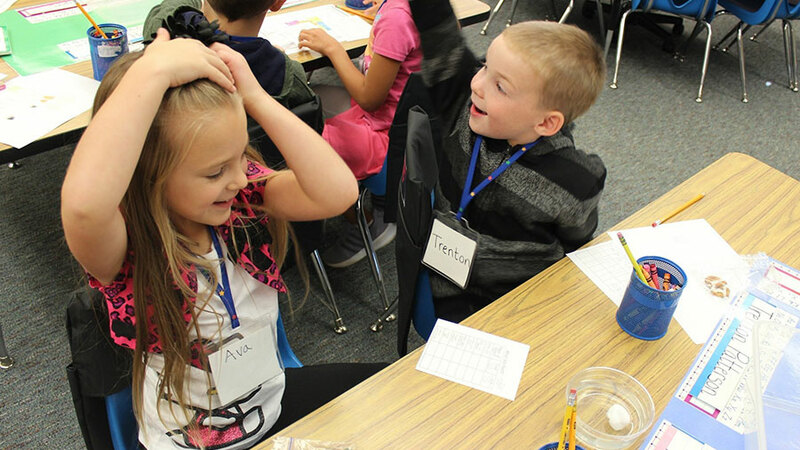 The Name Game Writing Your Name Activity: Students practice building and writing their names using the following activities. The multiple activities included provide differentiated instruction based on students’ needs: Activity 1 – Build, Trace, Write, Activity 2- Rainbow Write, Activity 3- Writing Worksheet. Top and Bottom Toys Activity: Play the Top and Bottom Board Game to practice identifying the positions: top, middle, and bottom. The goal of the game is to be the first player to get rid of all of your toys by placing them on the correct shelf (top, middle, or bottom). Treasure Hunt Following Directions Activity: Play the Treasure Hunt board game to practice following directions and collect treasures. Each player selects a pirate playing piece and places on the “Start” spot. To move around the board and collect treasures, take turns drawing a “Direction Card.” Read and follow the directions to move spaces, jump to certain spots, or collect a treasure! The game is over when one player has made it to Treasure Island or all treasures have been collected. We Go Together Matching Activity: Play a picture card match game to pair items that are related. Select one of the five colored sets of picture cards to play with (orange, blue, red, purple, or green). Lay the cards face down on a surface or in a pocket chart. Students take turns flipping over two cards to see if they can find two cards that go together. When a student finds a match, they may keep the pair. Play continues until all cards have been paired together. After game play, students draw the matched pairs on a worksheet. Writing Your Address Activity: Learn to write your address by playing “Roll-An- Address” and completing various worksheets. Use the worksheets to learn and practice writing your address. Grab a partner and compete to be the first to finish writing your address. Roll the die and fill in the part of the address designated on the die. Take turns until one player has completely written their address on the player board. This Kindergarten Basic Skills Activities Bundle is available for download on our TeachersPayTeachers Store! Click Here to get it and start using it today! You and your kids are going to love these Kindergarten activities for teaching basic skills.